As an update to this post, I confirm that using vgaswitcheroo to shutdown the discrete AMD/ATI card on the new Sony Vaio S, works perfectly also in 12.04 (Precise Pangolin). Where the + sign indicates that the Integrated card (Intel) is currently in use and the Off keyword in the 1:DIS: entry indicates that the discrete AMD/ATI card is powered off. IMPORTANT NOTICE: This product uses the Remember The Milk API but is not endorsed or certified by Remember The Milk. This is my third update for this Lens. Unfortunately, as some of you might have noticed, the previous two have disappeared. There are many available options to record your desktop on Ubuntu, but I’ve found only one of them to be properly working with my configuration. 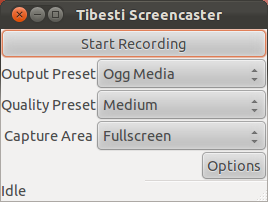 This seems to be the most popular option when talking about screencasting software for Ubuntu. It can easily record video + audio from your microphone and it is very easy to use it. My problem is that the recorded video will not be synchronized with my actions, resulting in glitches, delay and low frame rate. If it works with your configuration, good for you. This application works really well for video recording, however I wasn’t able to record audio from the microphone. Anyway, I have to admit that didn’t spend much time trying to fix the audio configuration. The settings dialog is rich of options and the application is highly customizable. or through the software center. This application is not present by default in Ubuntu repositories, but you can find instructions on its home page on how to add the PPA to install it. The application is very simple to use but I had major issues when recording videos. After a few seconds, the video stopped recording what was being displayed on the desktop and started collecting a big delay. It must be remarked that recording audio from the microphone or from the system out is very easy, but the video problem prevented me from using this application. There are many tutorials on how to use ffmpeg for recording the desktop. It is also possible to easily record audio from the microphone. One of the most useful resource I’ve come across is this page on Ubuntu Forums. This is a very effective solution, but a GUI approach is preferred by most users for this kind of applications. This is the winner for tonight contest on desktop recording applications. Kazam is not present in Ubuntu repositories, but you can easily install it using the .deb archive that is provided on the launchpad page. Kazam really had all the features of a modern desktop recording application for a modern OS. I was quite surprised for not having found it in the official repositories. If I have omitted some other relevant desktop recording applications, just let me know about it. This system, called Hybrid Graphics, is intended to provide users with two different and ready-to-use configurations to regulate performance vs. power saving modes. VAIO notebooks have a STAMINA/SPEED hardware switch to decide which one of them to use. It works pretty well on Windows 7, where you can use the STAMINA mode to activate the integrated card and increase battery duration or the SPEED mode to activate the AMD card and get the best performance out of this notebook. Things are a bit different on Ubuntu. Ever since I own the notebook (Ubuntu 11.04 and 11.10), not only I’ve never been able to use the STAMINA/SPEED switch, but I’ve had a lot of problems when trying to use the AMD card in a “static” configuration (however, AMD is working on their proprietary Linux drivers and they are progressing a lot: http://www.phoronix.com/scan.php?page=news_item&px=MTAyNzk). The good thing for me is that I don’t need to use the AMD card at all. The Intel one works very well for pretty much everything, including HD videos and any kind of desktop effect. However, I’ve never tried games. So, the solution for me has been simple: do not use the AMD card! There’s still something missing however: you cannot completely forget about the discrete graphic card, if its fan keeps spinning as loud as a vacuum cleaner or if it is producing so much heat below your wrist! And that’s all, from next restart you can forget about the AMD card.